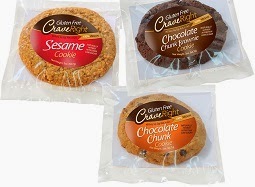 Today I am going to tell you about Delicious, Naturally Nutritious, GLUTEN-FREE, 100% Vegan Cookies called CraveRight™. Most of you know I try to stay away from pre-packaged foods, because of the lack of nutrition and because they are usually full of fillers. This company is different. If you want a treat, don't have time to bake, Then CraveRight™ is your new best friend. All of their cookies are gluten-free, nut free and 100% vegan. They bake and prepare them in a dedicated gluten-and nut-free environment so you never need to worry cross-contamination. Each cookie is rich in antioxidants, and packed with essential amino acids.Their cookies do not contain empty-calorie ingredients; there are no flours, starches or fillers in their cookies. 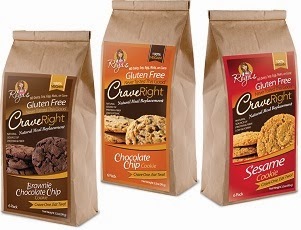 CraveRight™ cookies are iron- and calcium-rich and low sodium, great for pregnant moms, children and people on restricted-sodium diets. If you are on the east coast, you are in luck, You can get these yummy treats at Whole Foods. If not, you can order direct from them HERE ONLINE, or you can get them from Amazon. The other day my daughter and I were walking home from a very vigorous yoga class. We go to yoga with an empty stomach and an open mind. That left us starving. Needing to stop by Jimbo's on the way home to get fresh ingredients for dinner was a problem, due to my rumbling tummy. Not wanting to buy the whole store, I quickly grabbed a tub of peanuts. Taylor, having a sweeter tooth than me, grabbed a tub of organic dates rolled in oat flour. Needless to say, the second we walked out of the store, I opened the tub and started devouring the peanuts. Not my finest moment, but I thought I was going to pass out. Taylor quickly followed suit with the dates. Then she grabbed some of my peanuts, and the magic happened. She said: "oh wow Mom, you should try these together, they are so good!". At first I resisted, but knowing my daughter has a good palate, I caved. I grabbed some of the dates and the nuts and stuffed my mouth. Just a few seconds into chewing, my world changed. It tasted EXACTLY like a peanut butter and jelly sandwich. I am not saying kind of like a peanut butter and jelly sandwich. I mean exactly like one. I could hardly wait to get home and create magic with these ingredients. 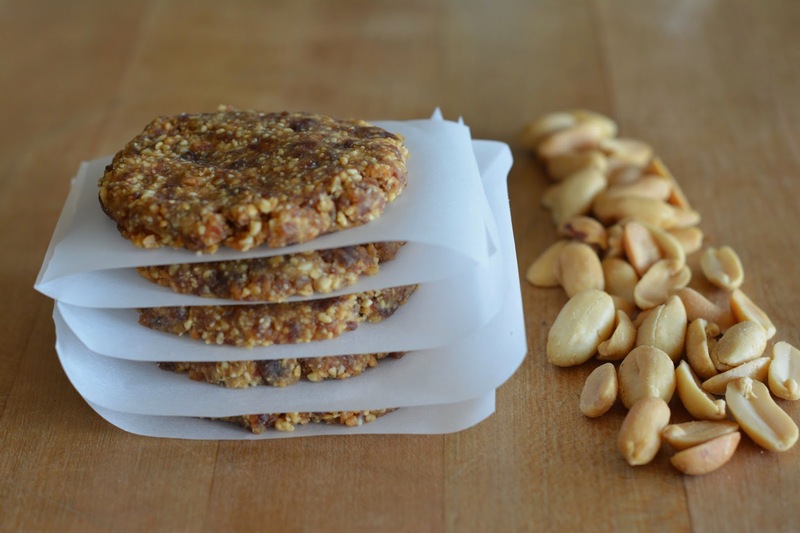 Now you can buy dates rolled in oat flour, or you can just add oat flour. The oat flour gives it the bread flavor. 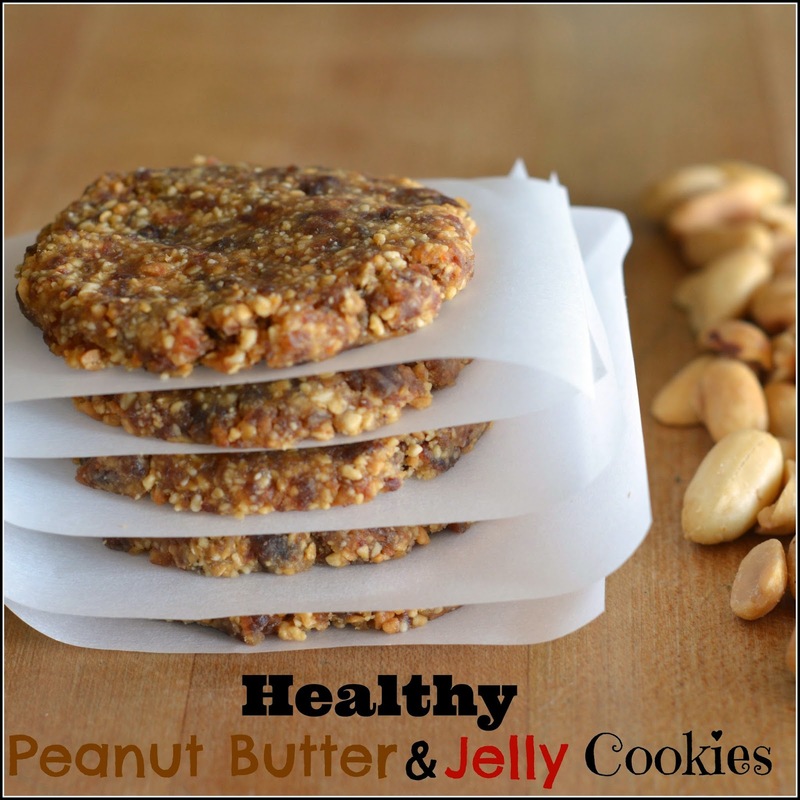 You can omit the flour too for an even healthier treat. It takes 5 minutes to make these. I will now have them available at all times. Suitable for breakfast, lunch, and snacks. I mean... wouldn't you eat a handful of nuts and dates and call it healthy? I cannot wait for you all to make these. Finally guilt-free peanut butter and jelly!!! 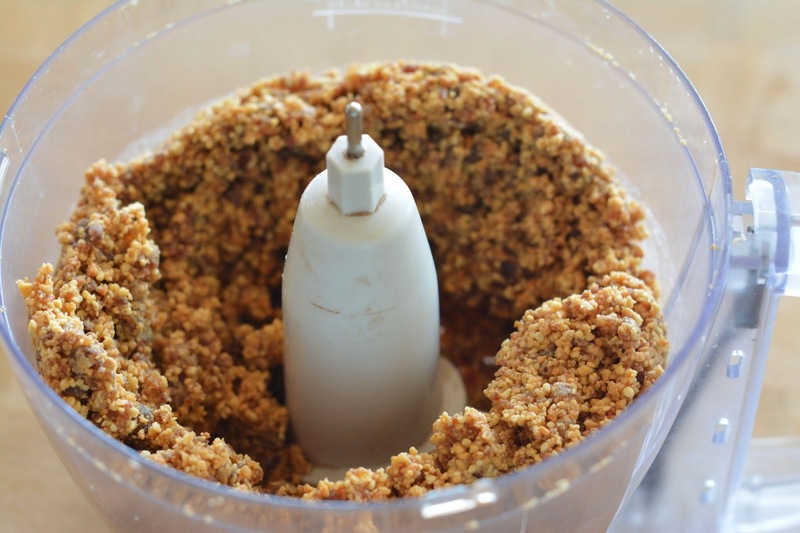 Place all ingredients in the food processor and process until a dough forms. 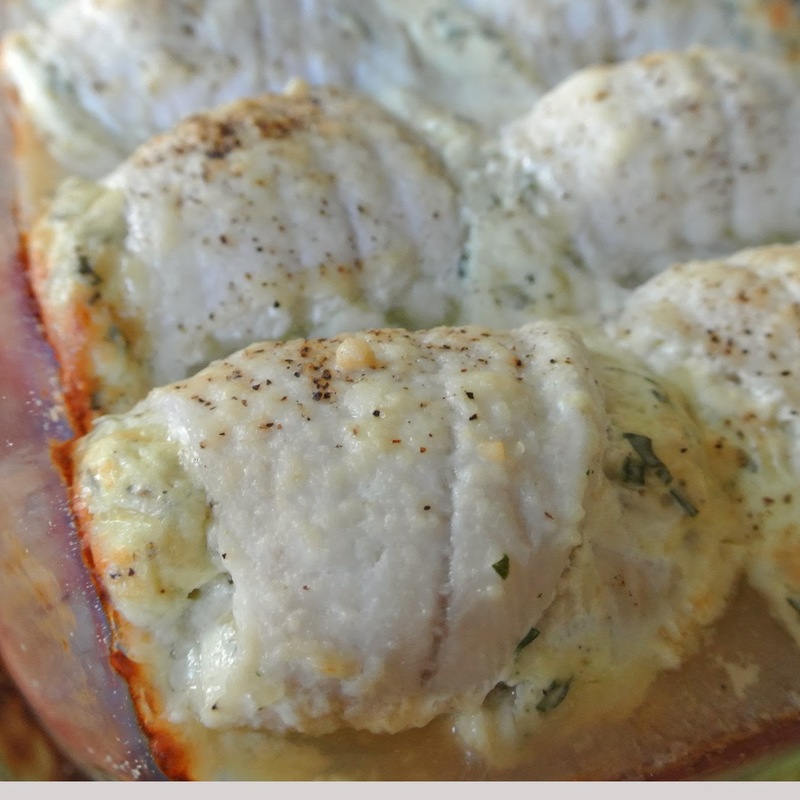 Roll into balls and press flat on parchment paper. One member of the family truly is always ‘there’ for you. You know, the one who runs to meet you at the door when you get home? The one who wants to play, exercise, and sleep next to you no matter how their day has gone? Heck, they’ll do just about anything to make you happy. You know who we’re talking about, right? Your dog! That furry family member who offers you unconditional love every day of the week, and who you love back just as much, if not more. But how do you return your dog’s love? Besides taking him or her for walks, playing fetch, cuddling on the couch and offering the occasional treat? 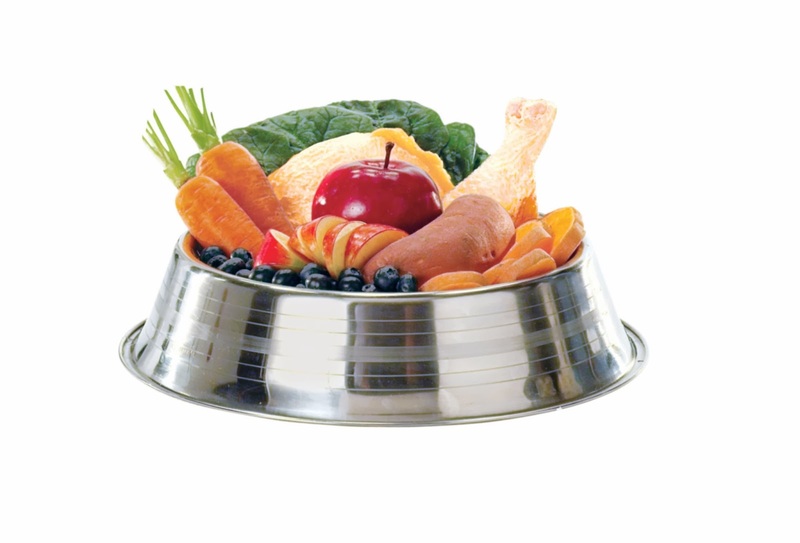 Do you feed your dog a healthy, natural diet? Did you know that a diet formulated with wholesome, natural ingredients could help your dog live a longer, healthier life, but that most dog foods aren’t made up of natural ingredients? As a leader in natural pet food, Wellness uses natural, high-quality proteins and fats in their dog food recipes. They also include fruits and vegetables for natural vitamins, minerals and other benefits, especially antioxidants that occur in blueberries, cranberries and some vegetables, which help make their dog food products some of the healthiest options in the marketplace. 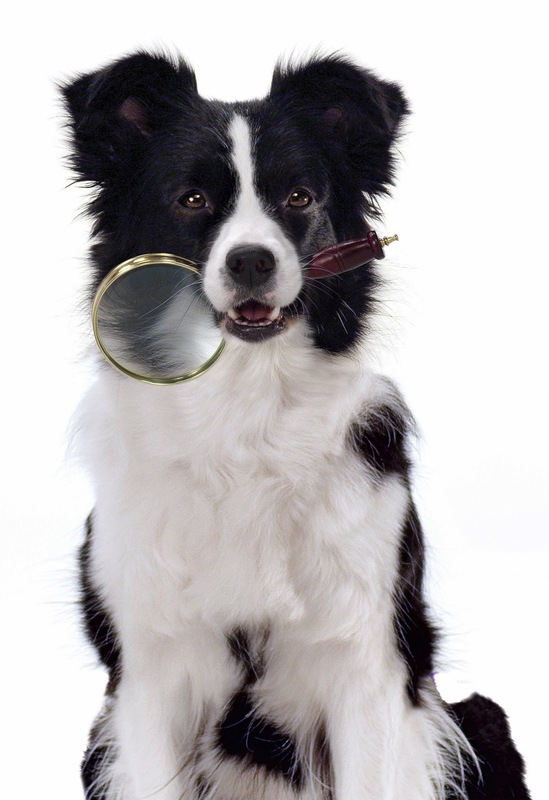 Wellness recipes do not include added artificial colors, flavors or ingredients, and they’ve even created a helpful Check Your Bag that you can use to compare their natural dog food to those from some competitors who claim to be natural. While Wellness might not be as widely-known as some of the more mainstream brands of dog food, their devotion to quality and natural, high-quality ingredients makes their food safe, wholesome and beneficial to pets’ health and well being. 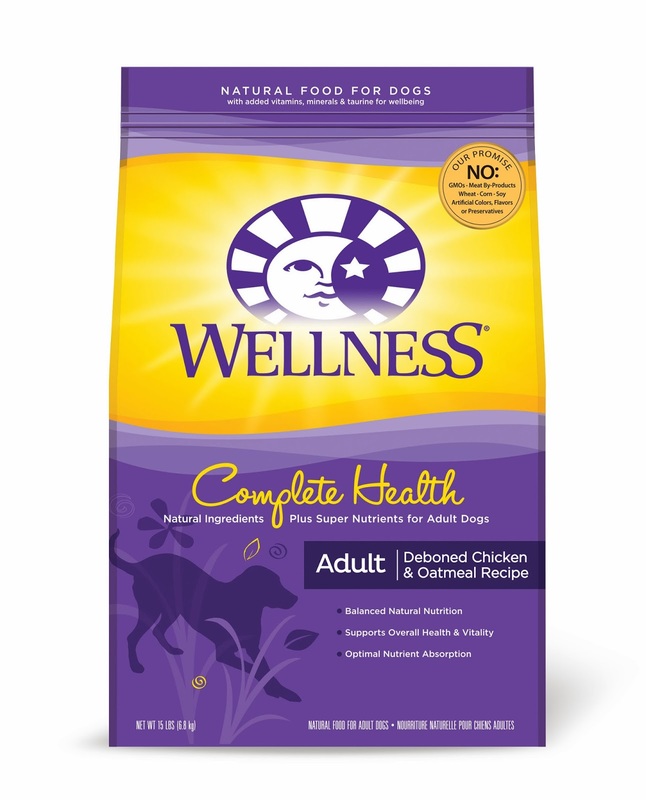 To pick up a bag of some of this high-quality, natural dog food, you can order it online or stop by one of the retail locations listed in the Wellness Store Locator. But be sure that you also connect with their Naturally Well Pet Community, a free online program that provides exclusive savings offers, fun contests and helpful tips about keeping your pets happy and healthy. And consider following their Facebook page and Twitter feed, where you can join in on the fun with a huge group of fellow animal lovers who share heartfelt, funny stories, entertaining photos and videos of their pets. If you’re at home as you read this, it’s a good bet that your dog is sitting right next to you, watching your every move. Take a quick moment to tell them about the importance of eating a natural diet, then watch the look on their face… we promise they’ll still love you! This is a sponsored post, however all views expressed are my own. 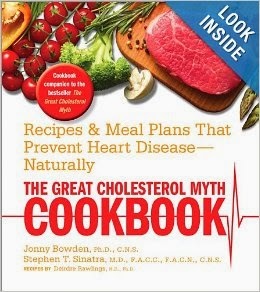 I recently had the pleasure of reviewing the great book: The Great Cholesterol Myth Cookbook. What a treat! I took longer on this book because I absolutely LOVED it! 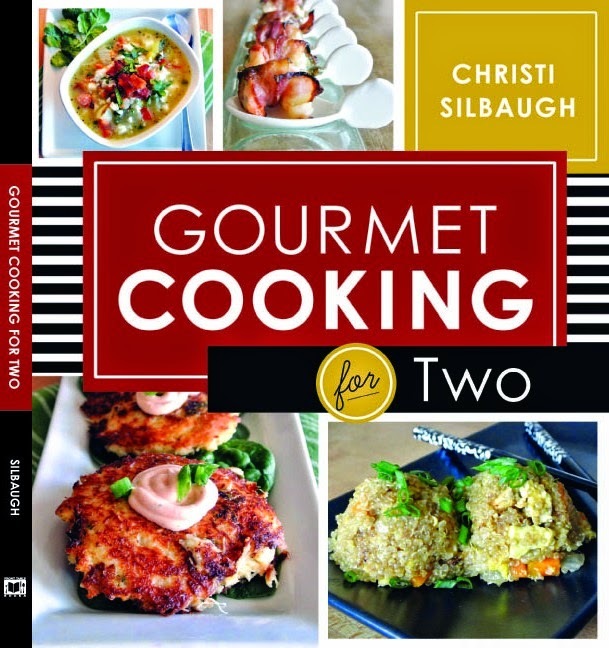 This cookbook is filled with information that everyone should know, yet most of us don't. About 10 years ago I got to read the Fat Fallacy. It changed the way I ate. No longer afraid of real food. Instead, you should be afraid of the processed fake foods that the big food companies try to convince you are healthier. This book touches on that and dives much deeper as well. The doctors that wrote the book, argue that fat—often curtailed on traditional low cholesterol “heart-healthy” diets—is not the enemy and may in fact be part of the solution. 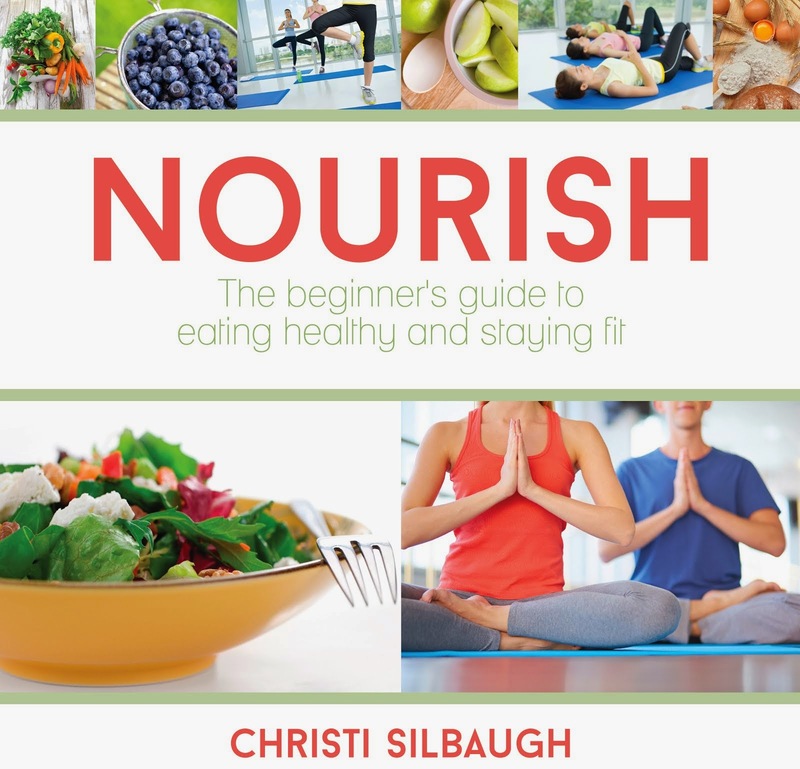 The book includes 100 delicious and nutritious recipes that will prevent and reverse heart disease and give you back the foods you thought were gone forever. 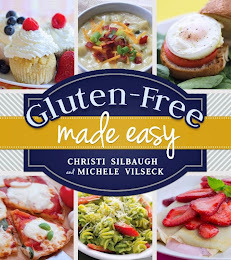 The recipes are very easy to follow. You will do you, and your family a favor by picking up this book. I adapted today's recipe from The Great Cholesterol Myth Cookbook. With only 360 heart healthy ingredients per serving. 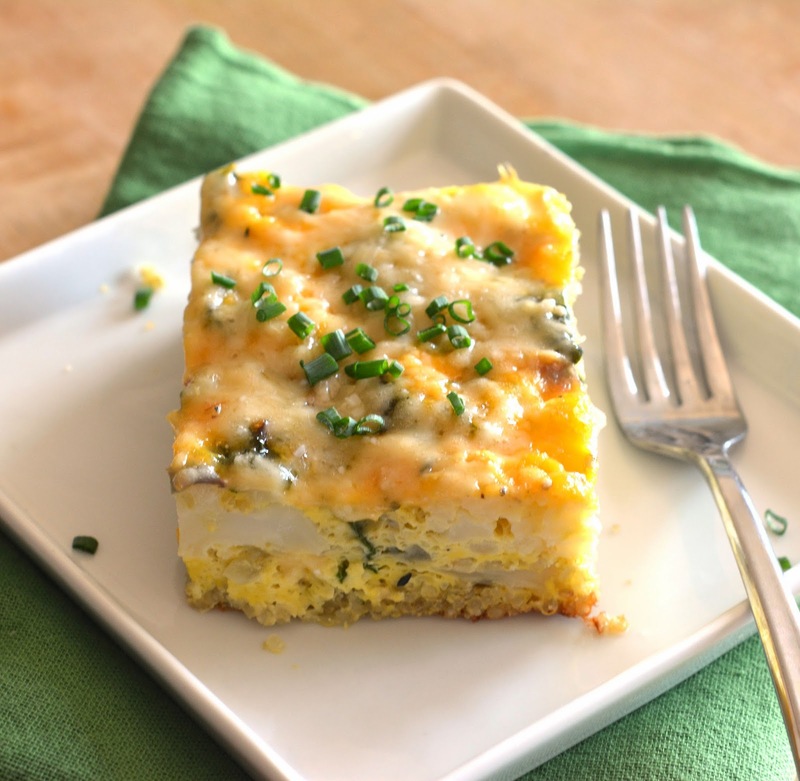 This quiche is full of nutrients and comfort at the same time. Enjoy! adapted from The Great Cholesterol Myth Cookbook. Rinse the quinoa well and set aside to drain. Heat the oil in a pan over medium heat. Add the onion and garlic and saute until the onion begins to brown. 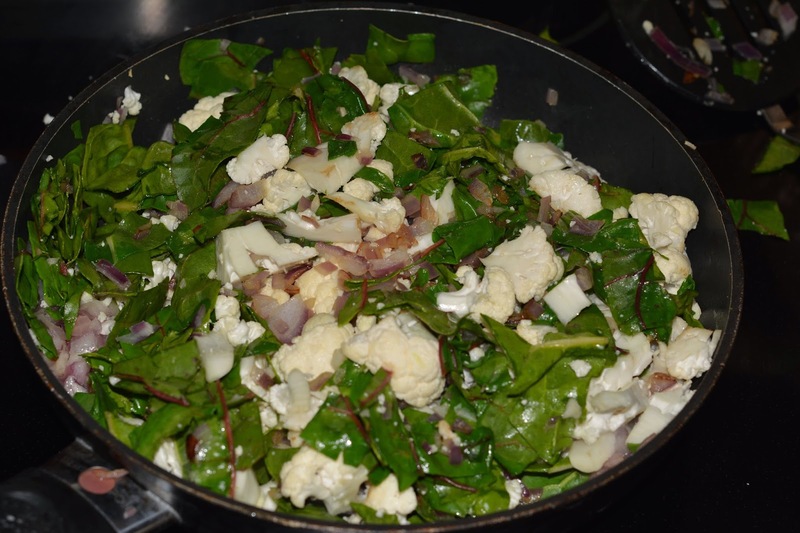 Add the Swiss chard and cauliflower and saute for 1 minute, then turn off the heat. 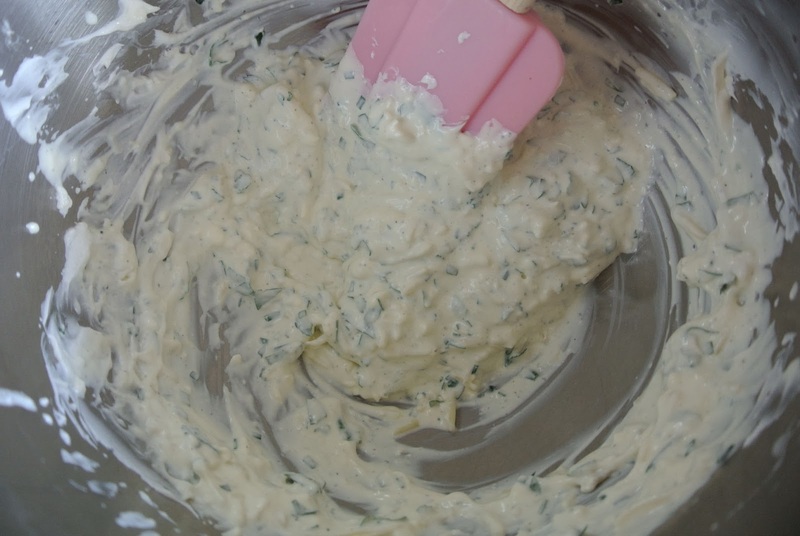 Transfer the mixture to a lightly greased 9x13 inch baking dish and spread evenly. 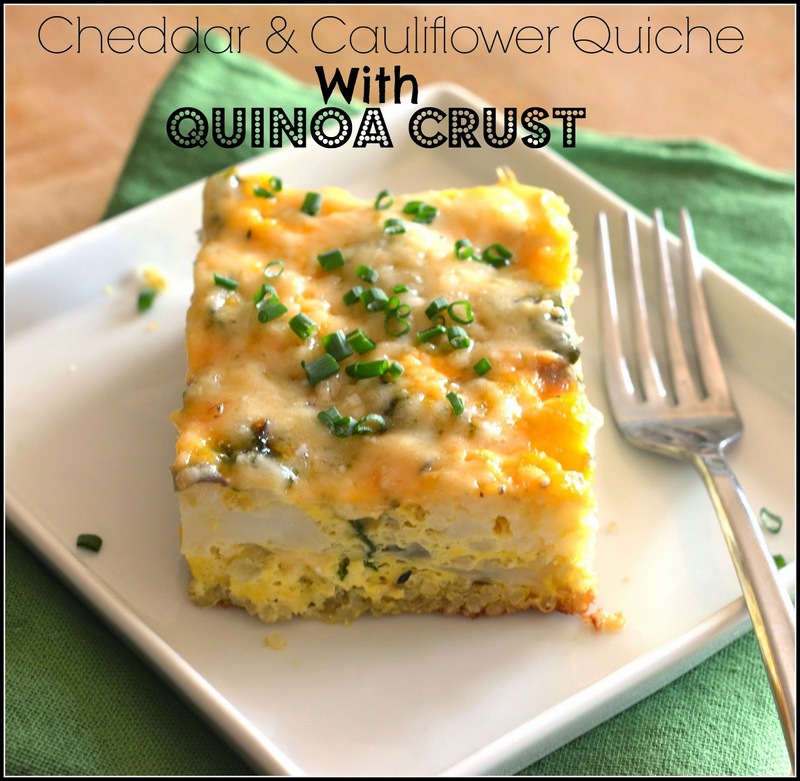 In a large bowl, combine the eggs, milk, thyme, salt, and pepper, and rinsed quinoa and whisk until thoroughly combined. 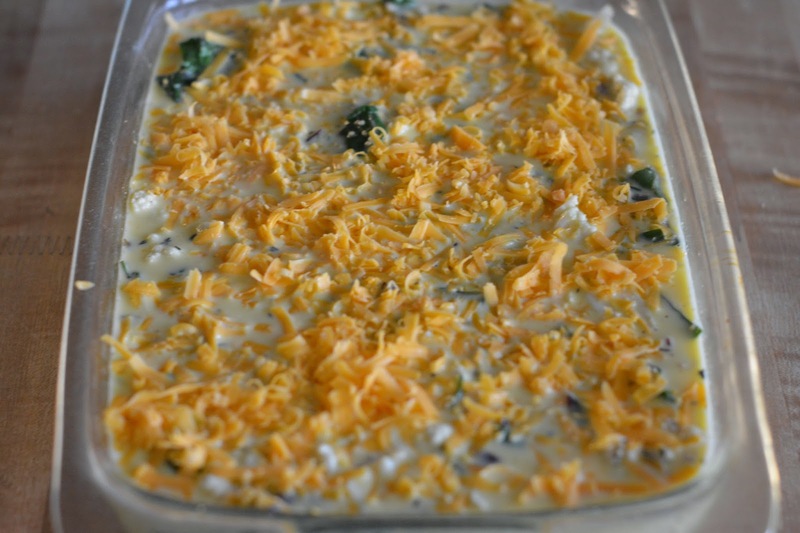 Pour immediately over the cheese topped vegetable mixture. 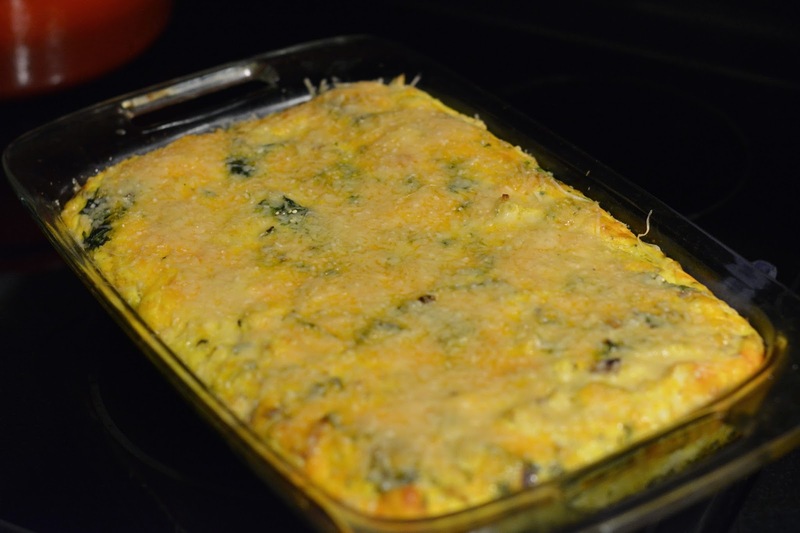 Bake the casserole in the oven for 40 minutes. 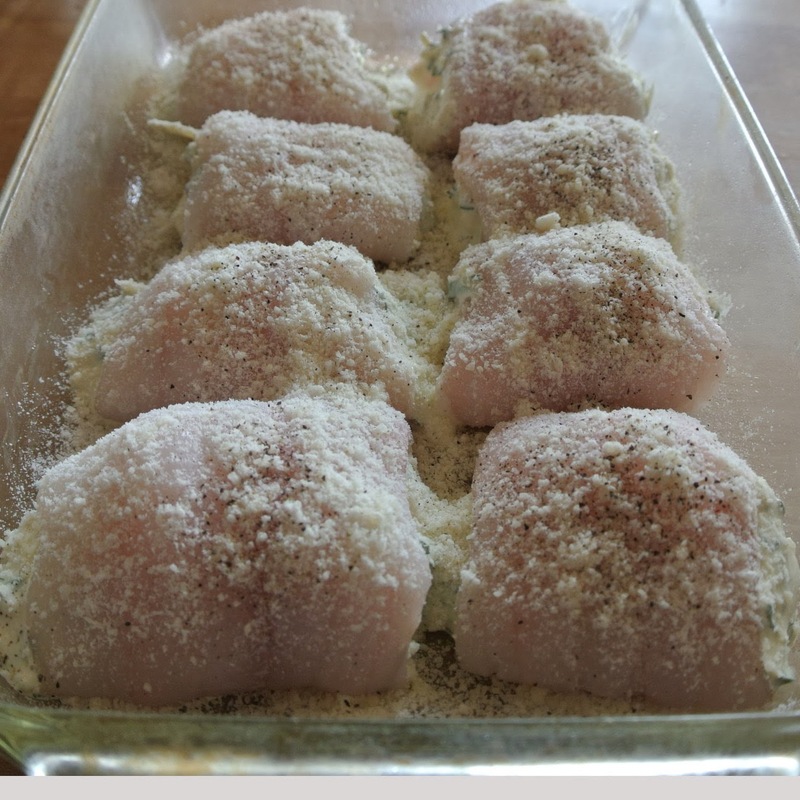 Remove the casserole from the oven and sprinkle the Parmesan on top. Return to oven and bake for 5 more minutes to melt the Parmesan. Let rest for 10 minutes before you serve. Hello all of my beautiful readers! Oh how I have missed you! I took a week off for my birthday. I had finished my 2nd book and just needed a break to refuel and have time for the creative juices to flow once again in my head. I had a great time working on my yoga body, spending time with friends, and just relaxing. 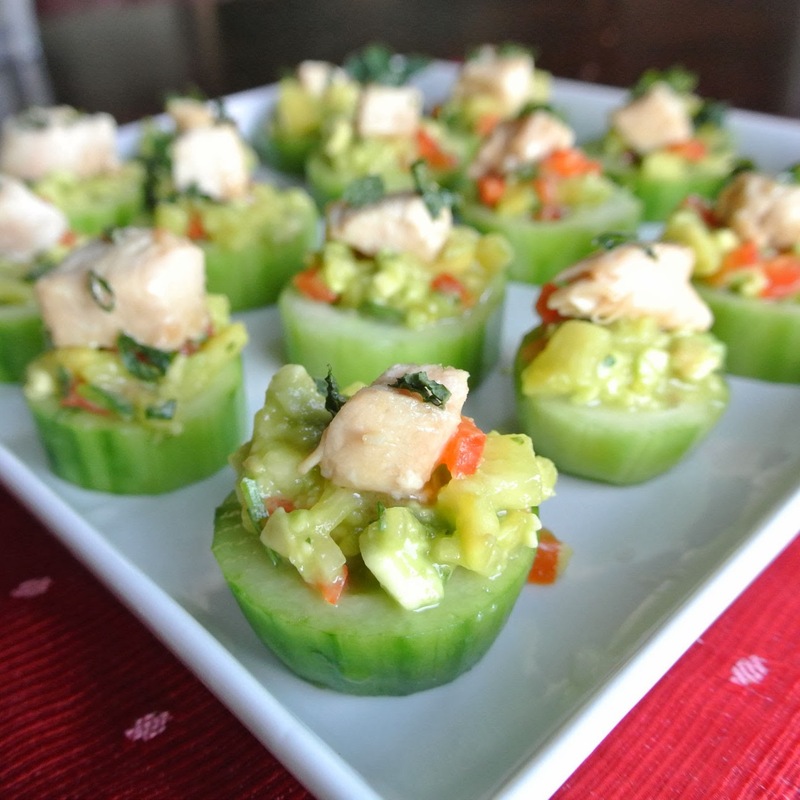 Today I am bringing you these tasty appetizers. I am content just eating these and skipping the main meal. They are that good. Make them and take them to a party. It will be the recipe everyone asks for. 2 cucumbers sliced 1/2 inch thick. 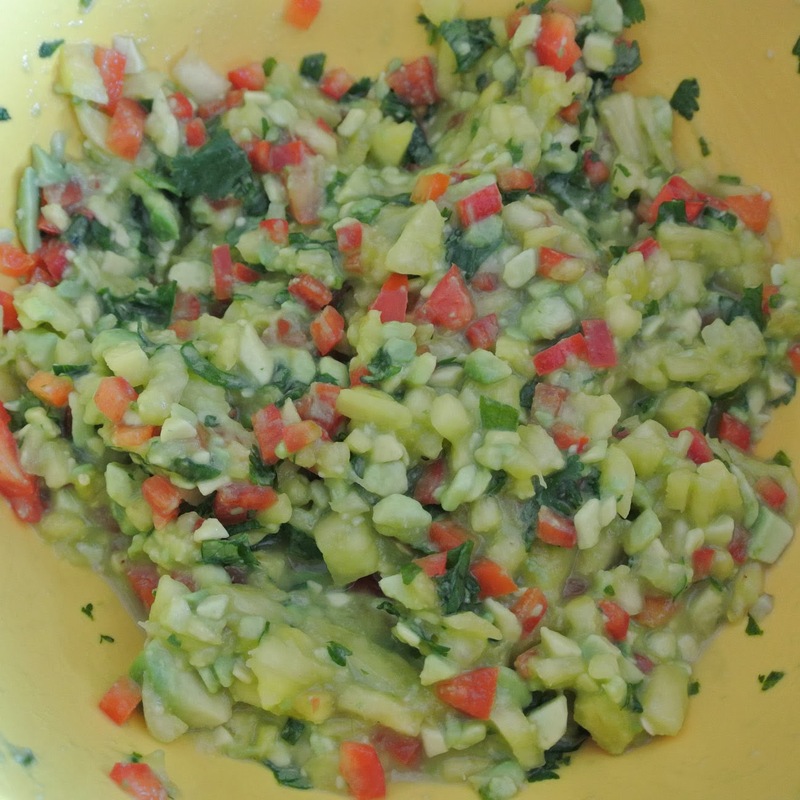 Start by making your avocado pineapple salsa. peel, core and trill the pineapple once it is cooked, dice it. Dice up all peppers, onion and cilantro and add them to the pineapple. 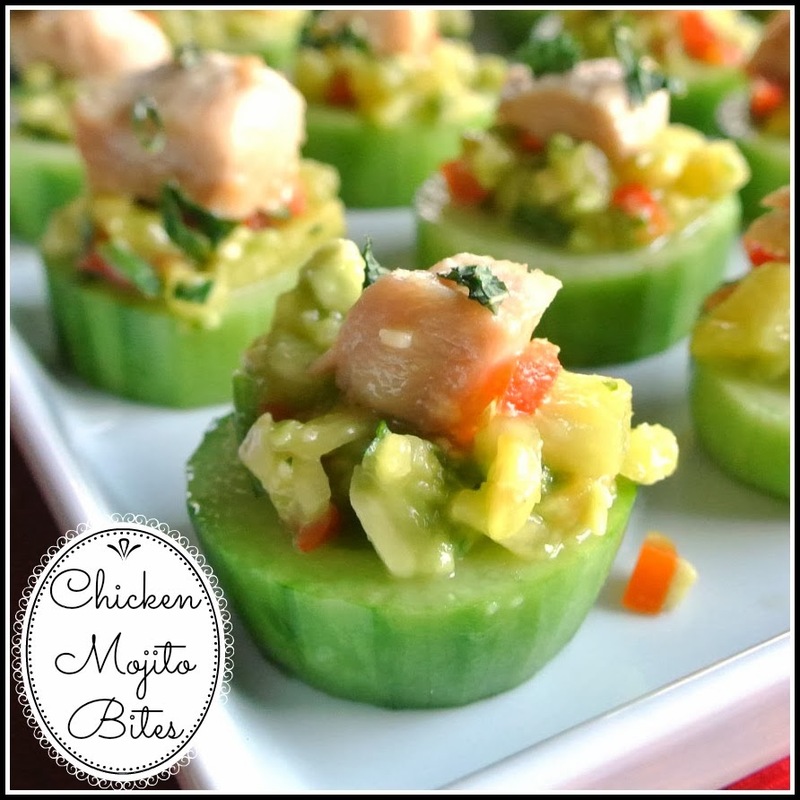 Mix in the avocado gently and garnish with chopped mint leaves. Set in fridge while you finish the chicken. Saute and season the chicken, add a pinch of shallots and garlic. Deglaze the pan with the lime juice. Remove the pan from the flame and add rum. Add brown sugar, vegetable stock, mint and butter. 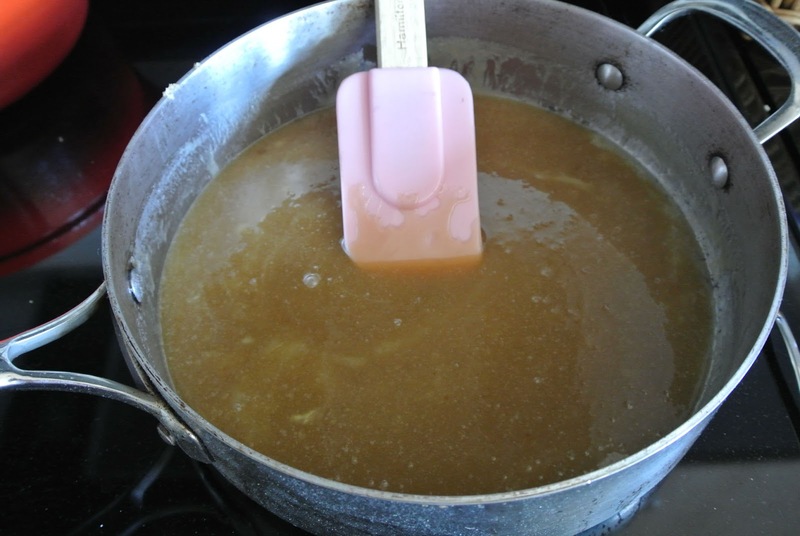 Reduce liquid to a caramel. 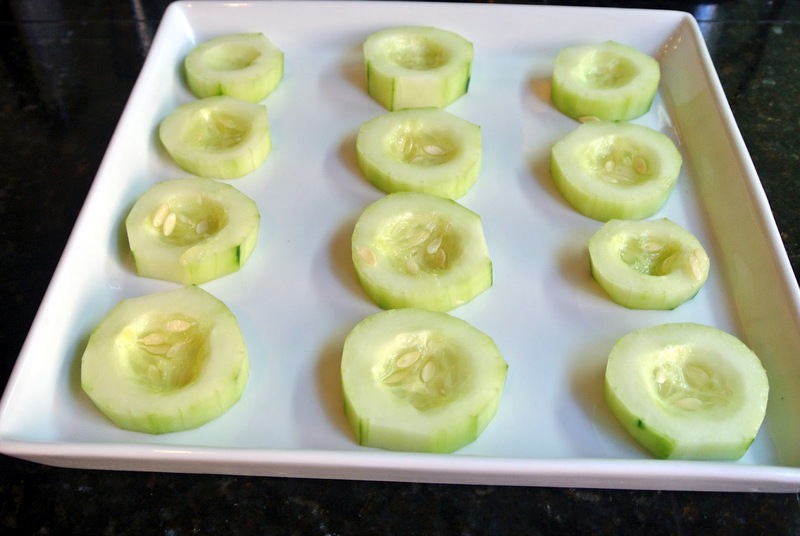 Set out your sliced cucumbers and make a cup out of them by scooping out a small portion of the seed area. 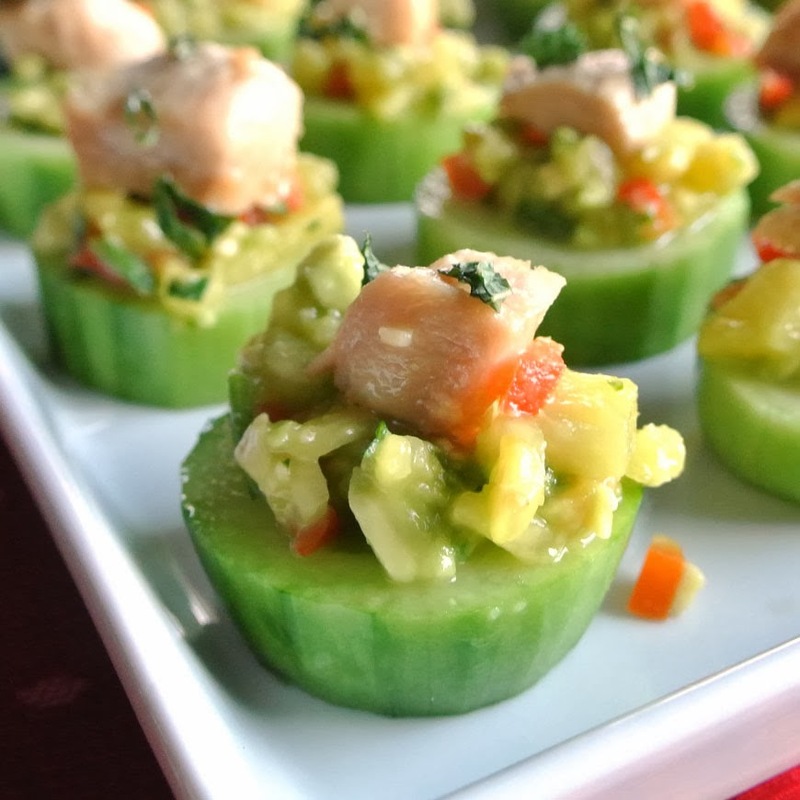 Top your sliced cucumber cups with the salsa. 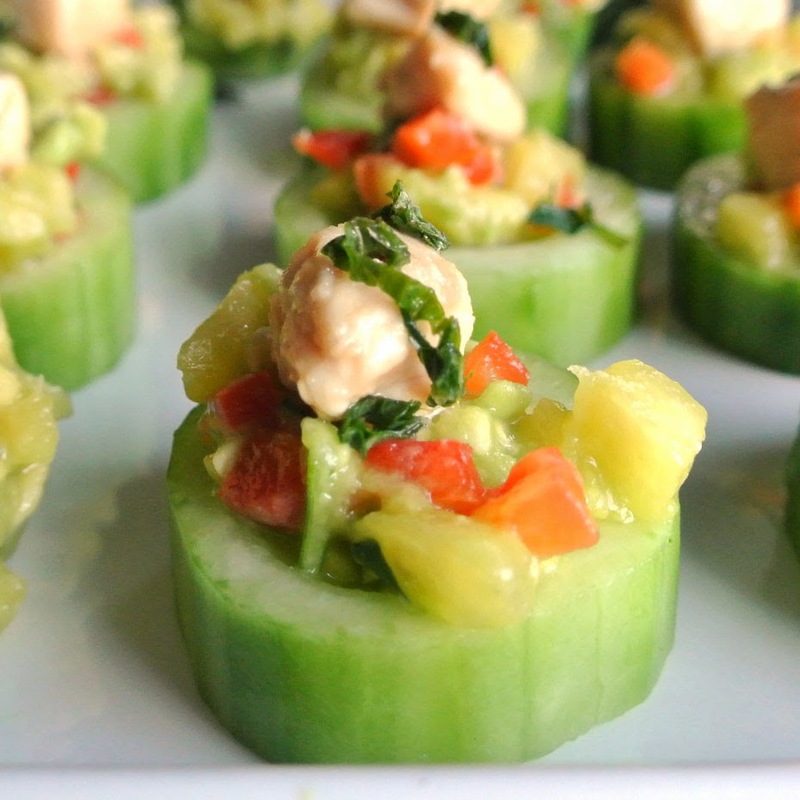 Garnish with mint and cilantro and serve! This dish can be served hot or cold. Perfect for a party! How are all of you doing with your New Year New Health goals? I am doing so well in my health. As a matter of fact I have dodged several colds that my husband has come down with. Eating 100% organic fresh local food, exercising a minimum of 7 times per week (I am currently doing 9 yoga classes a week, not to mention my daily walks), working hard, playing hard, surrounding myself with positive non-toxic friends. Life is good! I am sleeping better than I have ever slept in my life as well. When life is in balance, it is a beautiful thing. On my healthy eating quest, I have been trying to get a lot more Avocado in my diet. Ever since I fought cancer, I am well aware of the health benefits of Avocado. So many people aren't though. I think it is because people are afraid of fat. We need good fat. Here, just stop for a second and read this article on 5 reasons to eat more avocados. That should about cover it for you. Listen, Avocados serve as a good source of both soluble and insoluble dietary fiber, with each 1-ounce serving providing 2.11 and 2.7 grams, respectively, as stated in “The Proceedings of Florida State Horticultural Society." High-fiber foods help normalize bowel movements, lower blood cholesterol levels and regulate blood sugar. Eating avocados every day, especially when used to replace foods containing saturated and trans fats, also helps reduce bad cholesterol, known as LDL, levels and decrease your risk of heart disease. The easiest way for me to get more avocado in, is snacking on them. 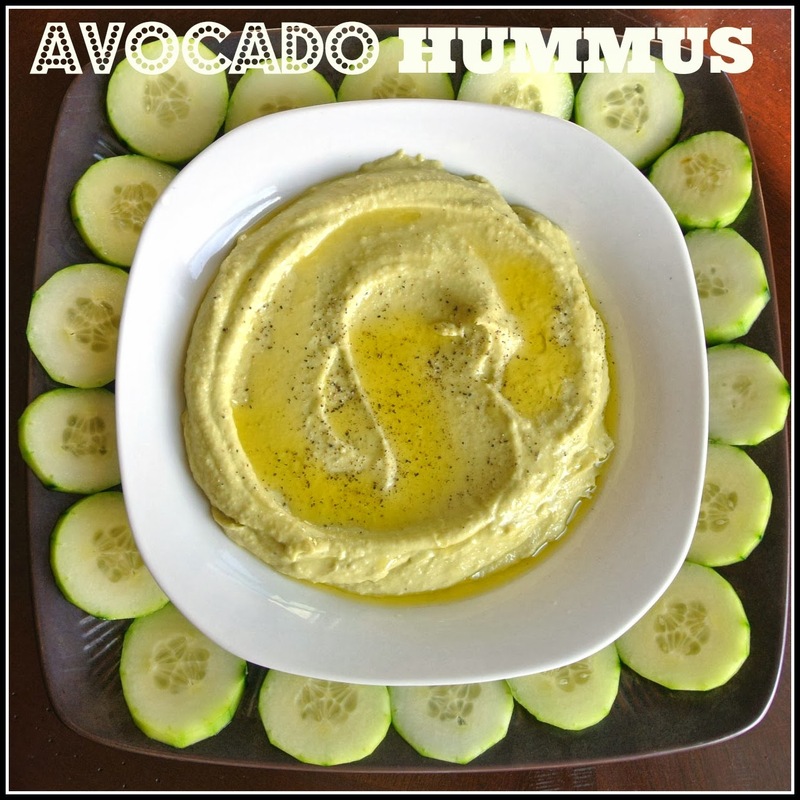 Since I am such a guac fan, I wanted to do another dip that I could use on my veggies. That got me thinking of hummus. Tada... the two are a perfect pair. 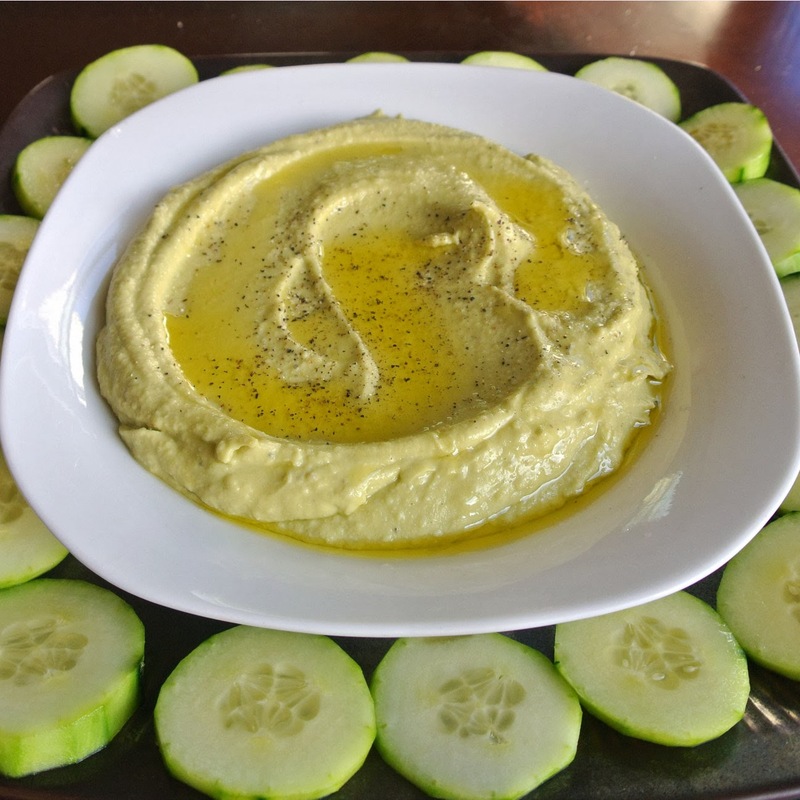 This extra creamy hummus was a huge hit! Enjoy! 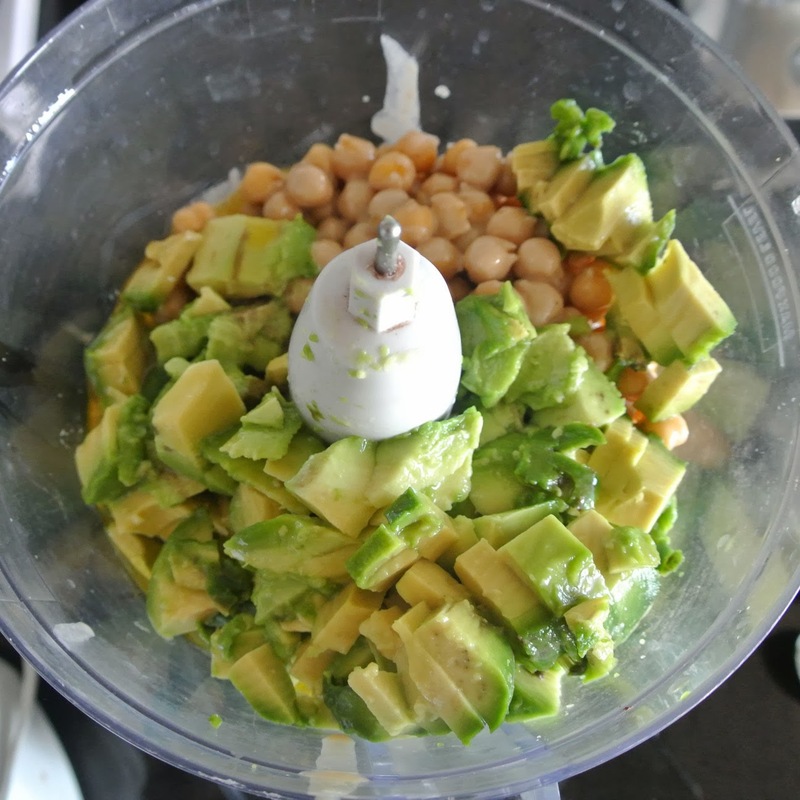 In a food processor, puree the avocados with the chickpeas, lemon juice and tahini. Add the 1/2 cup of oil and puree until smooth; season with salt and pepper. Transfer the dip to a bowl, drizzle with olive oil and serve with veggies, bread and chips. Today I am bringing you a treat. I won't say this treat is "healthy". I will however, say that this treat is a lot more healthy than traditional ice cream. The thing is, I believe in treats. Life is all about balance. So when I have treats, I just try to include some whole foods in there, so it is not complete empty calories. 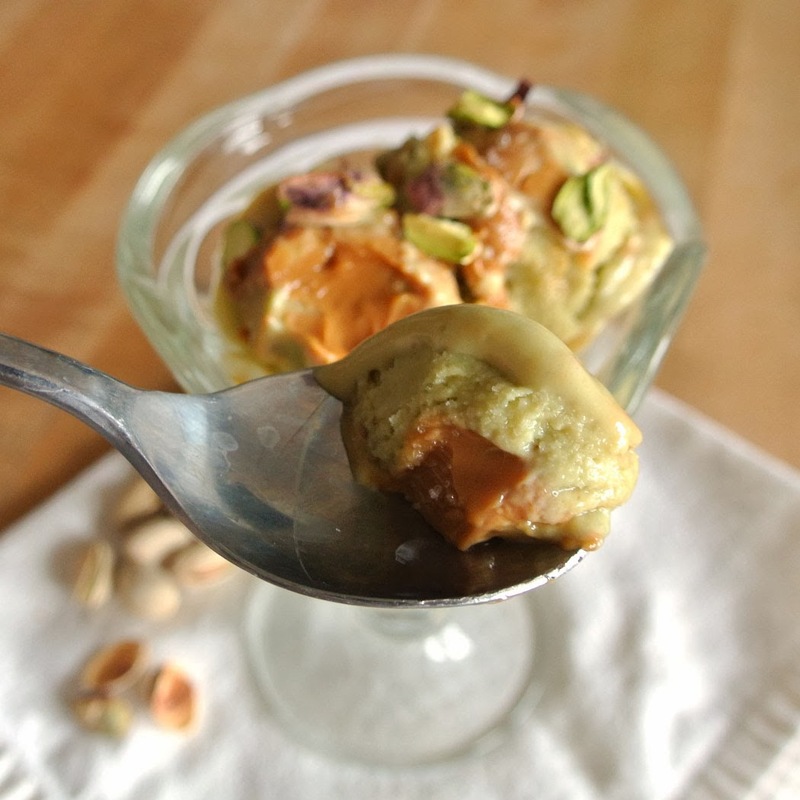 Now this treat has a secret ingredient that makes it so creamy and decadent. In fact, there is no cream in the ice cream portion of this recipe. What is that secret ingredient? Avocado's. Yep, and they make this ice cream taste amazing! You don't even taste them, they just add nutrients and a rich creamy texture that is wonderful! 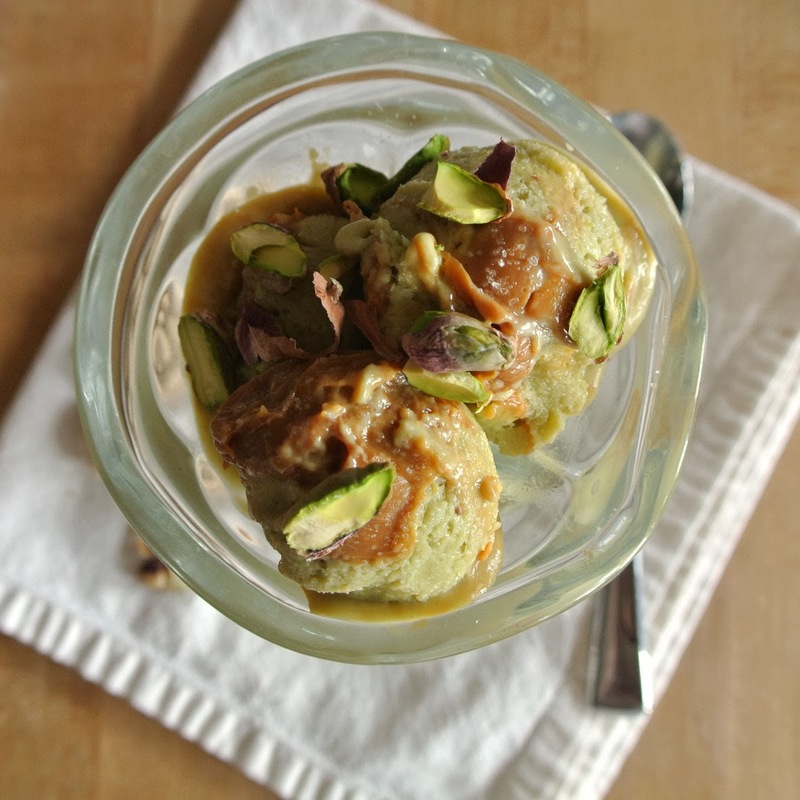 This ice cream is so good, you just have to trust me and give it a try! It will blow your mind. 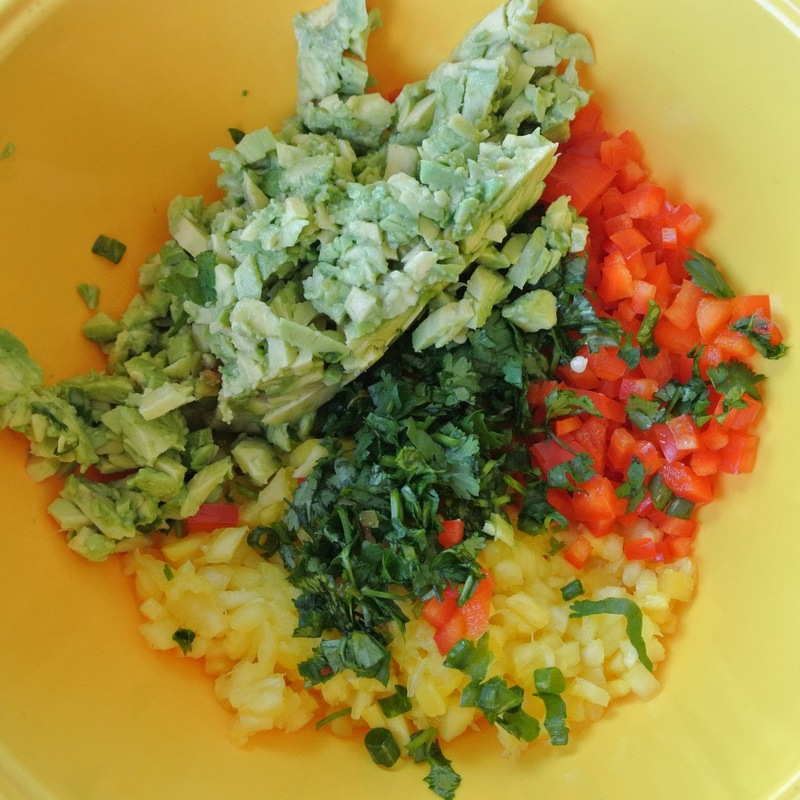 Pit the avocados and scrape the flesh into the bowl of a mixer or use a hand blender. Whisk, blend, mix (whatever method you prefer) until smooth. Add sweetened condensed milk and almond milk and mix until blended. Place in the freezer for 1 hour before adding it to your ice cream maker. Make sure the bowl or container of your ice cream maker is fully frozen before proceeding. Make caramel while you are waiting for your mixture to chill. Combine the butter, brown sugar, corn syrup, salt, sugar, and heavy cream. Bring to a boil and stir for about 5-10 minutes until caramel reaches the “soft ball stage” at around 230 degrees. Remove from heat, stir in the vanilla. Let come to room temperature to thicken. Take out your avocado mixture from the freezer. Add the mixture to your ice cream maker and process until ice cream consistency. This took 2 times for me. I did it for 20 minutes, then took and put back in the freezer for 1 hour. Then I processed it again for another 20 minutes. Once thick like ice cream, stir in your caramel. 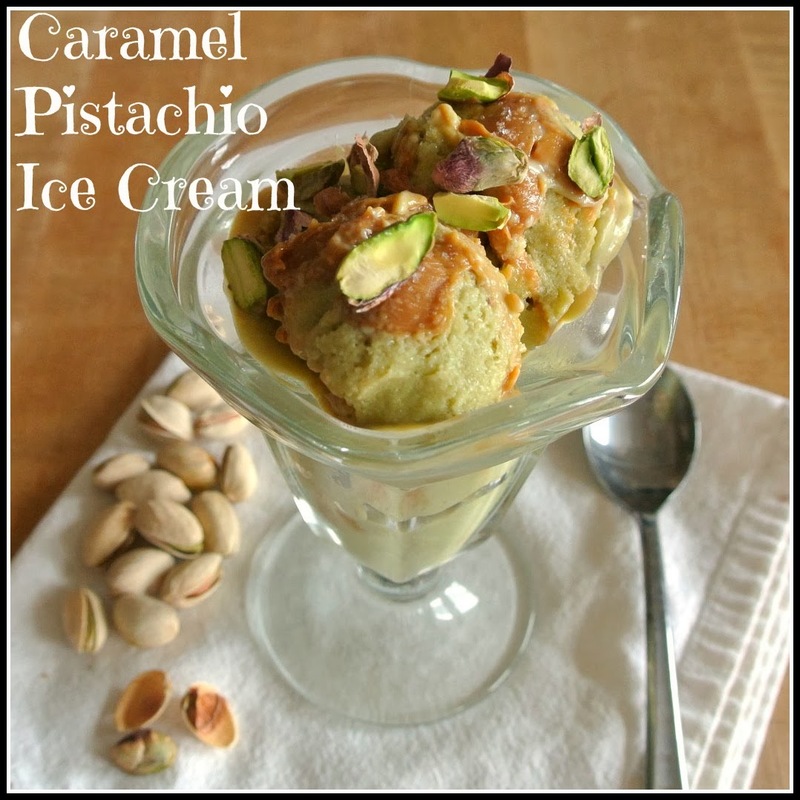 Top with pistachio's and serve! Pour mixture into an ice cream maker and mix for about 20 minutes. Then place the ice cream mixer bowl in the freezer for 1 hour. Pull it out after an hour and mix again for 20 minutes. It took me 3 times of doing this process for the ice cream to come out perfectly. 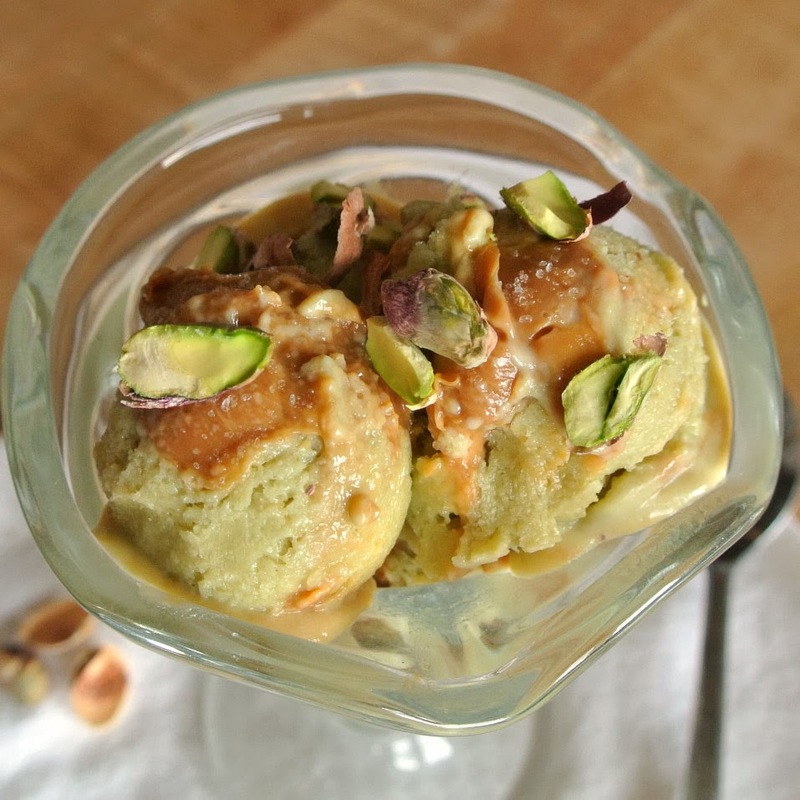 This recipe makes 1 quart of scrumptious Salted Caramel Pistachio Ice Cream. I am extremely sore. I have just finished 12 days straight of yoga, with some days doubling up and doing 2 classes. I took my first yoga class back in November. I was recommended it by my doctor that treated me for my cancer. I was desperate to get back in shape after being forced to be dormant for almost 6 months due to severe pain and treatment. The tumor I had in my uterus made me look 6 months pregnant. Something had to happen, but I had surgery to recover from and a lot of muscle mass to recover. So, that is why he suggested yoga as a great exercise for my body, and great healing for my soul. His advice was the best advice I could have ever received. Since November I have been going to yoga a minimum of 4 times a week. It is hard, but fulfilling. It is strenuous, but peaceful. You find yourself on the mat. 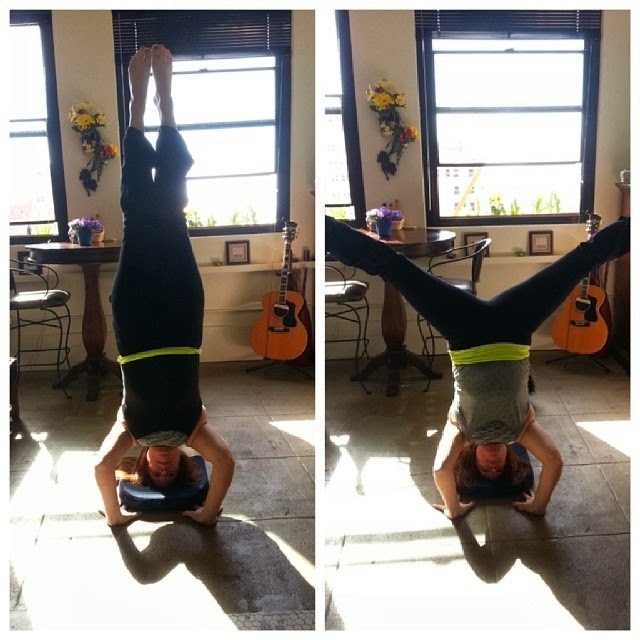 I have been participating in February's Inversions Make You Hot challenge. Here I am working on my headstands. 2 months ago I couldn't even do a push-up. I never successfully did a headstand as a child. So it is a huge victory for me to be able to do a headstand. I do them all day long now. So today is my first day "off" of yoga in almost 2 weeks. The thing is, I really want to go to class. They teach you to listen to your body though, and my body is asking for a break from class. That does not mean that I won't be doing numerous headstands through the day. I will most likely spend more time on the mat at home than I do in class. I love leaving my mat out through the day and whenever I feel like it, dropping into an inversion. Even though I am sore, I have never been happier. Having 75 minutes of meditation and hard work each day, really sets the pace for a great day! I hope all of you find your exercise niche. If you haven't tried yoga, I highly recommend it! 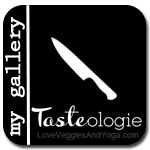 So today I am bringing you a healthy recipe that tastes sinful. I was so surprised by this dish. I had a friend coming for dinner and didn't want to spend too much time in the kitchen. Still I wanted to make her something yummy. 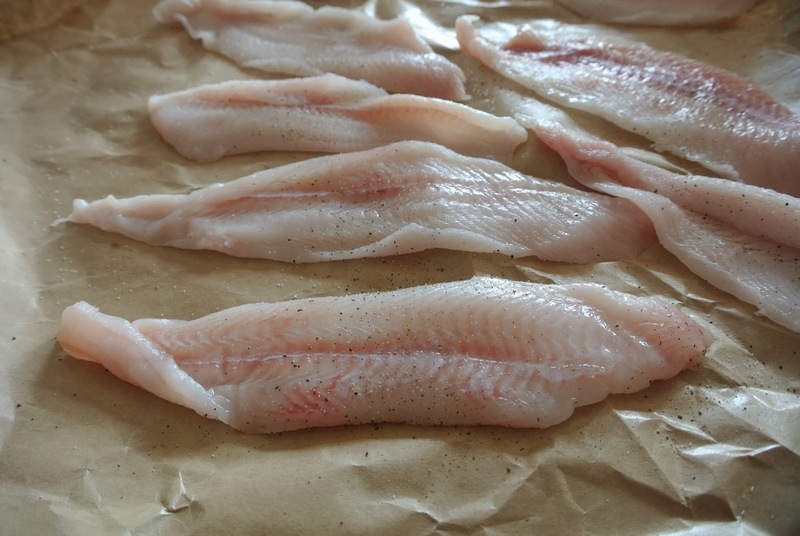 I went to the fish market and they had just got in some fresh wild caught sole. I had them slice it thin and hurried home to get busy. 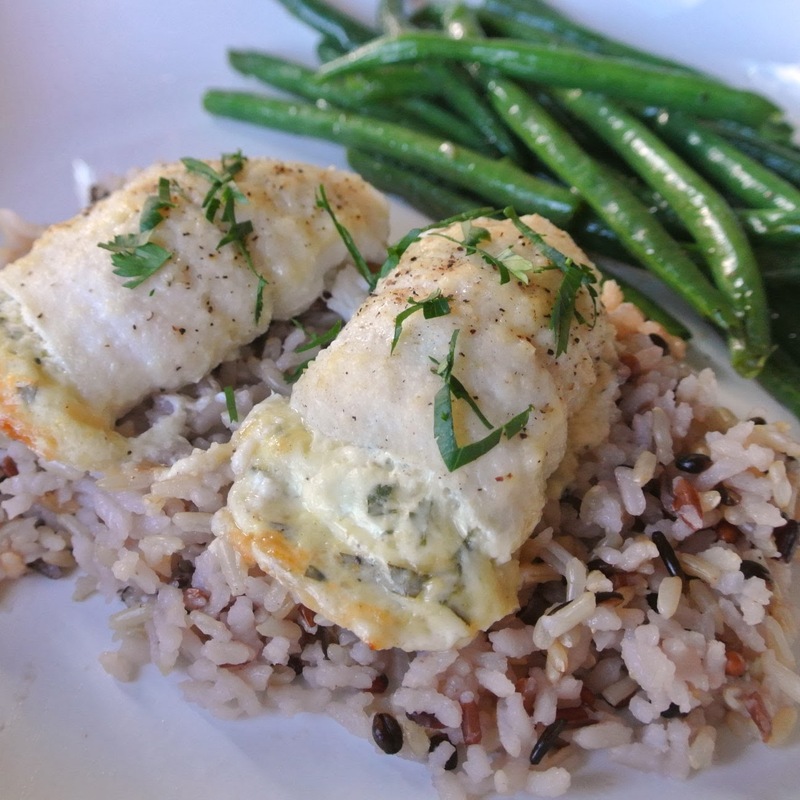 The combination of fresh herbs with high quality full fat greek spreadable yogurt (kefir) make this fish dish shine. Don't be afraid of real fat. You can use cream cheese instead, but I prefer the health benefits of greek yogurt. 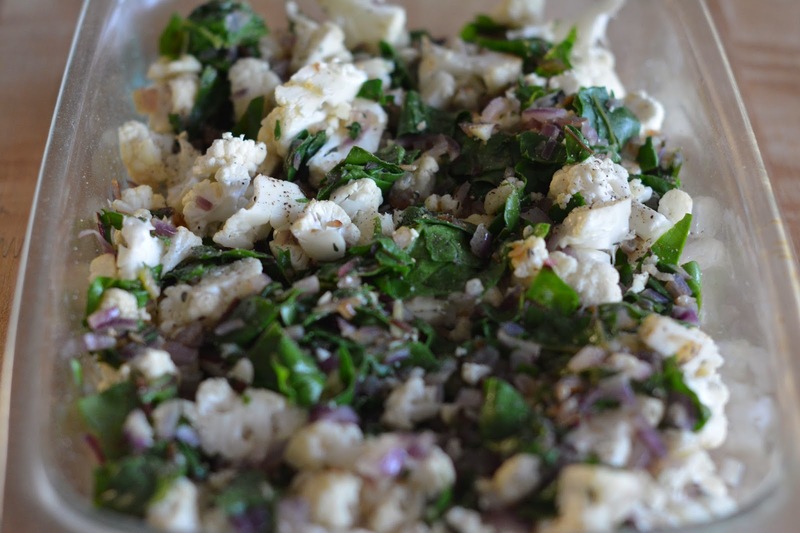 Mix your Kefir or cream cheese, Parmesan, and all the herbs and spices in a bowl. 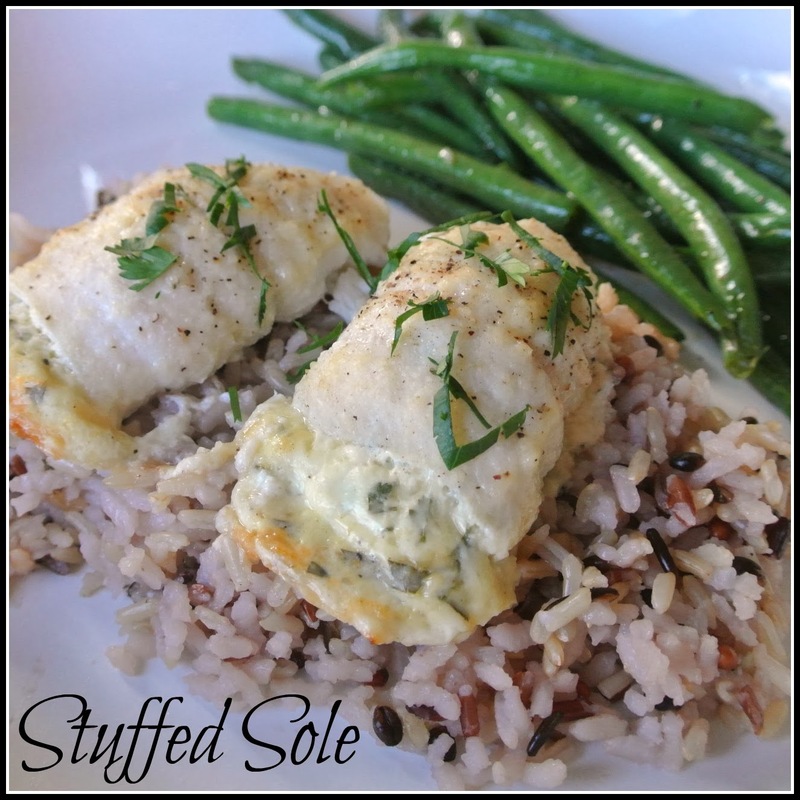 Lay out your sole and sprinkle with salt and pepper. Spread the mixture generously on top of your fish. 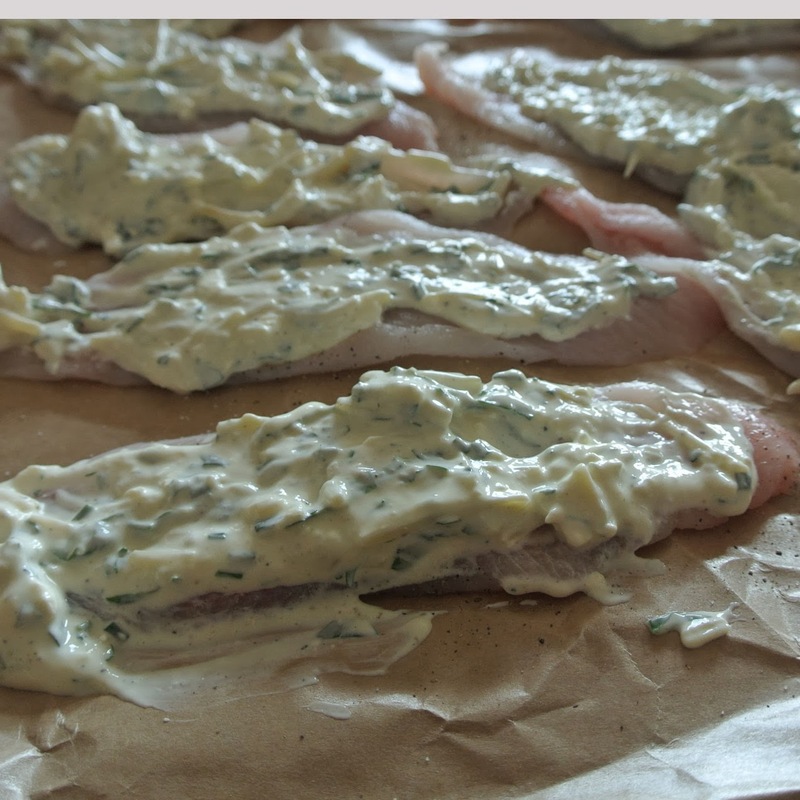 Roll up your fish and place in a prepared baking dish. Sprinkle with a bit more Parmesan and salt and pepper. 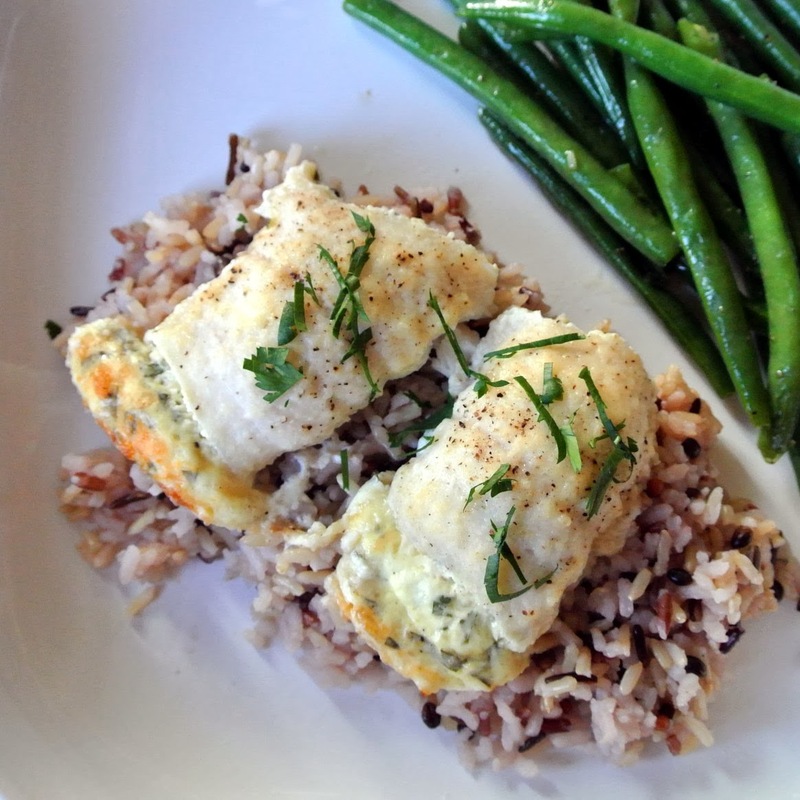 I served mine over a wild rice medley with green beans on the side. It was lovely.